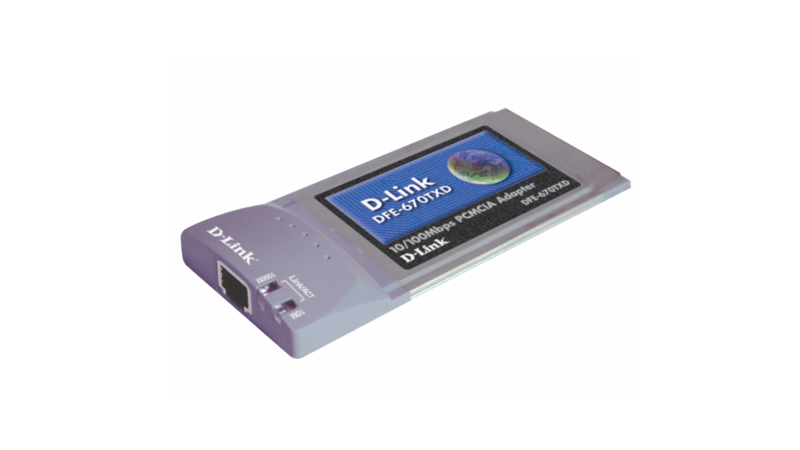 The D-Link DFE-670TXD is a 10/100Mbps Fast Ethernet 16-bit PC Card adapter for notebooks. With the built-in connector, a RJ-45 LAN cable can be directly plugged into a notebook computer. The DFE-670TXD provides instant connectivity for mobile users. Enabling easy access to a network - users can access databases and resources in diverse environments. The DFE-670TXD adheres to IEEE 802.3 and IEEE 802.3u standards, which specify existing 10BASE-T and 100BASE-TX Ethernet technology supporting both half and full duplex modes with data rates up to 10/100Mbps and 20/200Mbps. The DFE-670TXD also utilizes auto-negotiation to adjust the speed to any 10BASE-T or 100BASE-TX network automatically. With the DFE-670TXD's RAM data buffer, all incoming data is processed and stored into temporary memory and eventually filtered out, resulting in smooth data flow. The DFE-670TXD's extensive diagnostic LED’s show link connectivity for both 10Link/Activity and 100Link/Activity. Designed with a plug-and-play feature, the DFE-670TXD is simple to install and operate. With built-in hot swapping capabilites, the DFE-670TXD can be removed while the computer is still in operation.